News Bulletin: A new edition is being printed and will be available in mid-August. I hope anyone ordering the book is aware of this. -Hank, as of July 5, 2011. 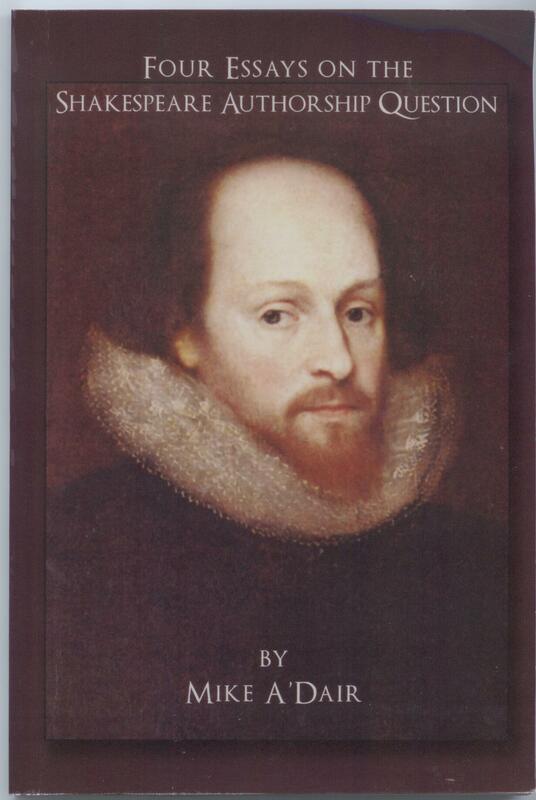 I’d like to introduce you to a new book entitled FOUR ESSAYS ON THE SHAKESPEARE AUTHORSHIP QUESTION by Mike A’Dair of Willits, California – journalist, scholar, poet, playwright, organic gardener and incisive thinker on the matter of Shakespearean authorship and Oxfordian biography. In ninety pages Mike does a great job of setting forth the facts and hypotheses in clear, succinct language that kept me reading straight through. He gives his views on the issues involved (the most controversial ones included) without apology. First he offers 34 reasons why William Shakspere of Stratford could not have written the Shakespeare works; in the second essay, he offers 40 reasons why Edward de Vere, the seventeenth Earl of Oxford, was Shakespeare *; and in the final two essays, he delves into the most dangerous territory, i.e., the theories that Oxford was both the son of Queen Elizabeth and the father of her intended heir, Henry Wriothesley, third Earl of Southampton, for whom the Sonnets were written and compiled. * Mike’s list of 40 reasons is completely separate from my 100 reasons here on this blog; any overlap will be unintended, but, I should think, also not unwelcome. Thanks Hank for the heads-up. I’ve ordered the book and will be looking forward to reading it. How can I adquire it…? Could you, please, tell me where did you order it…? Ricardo – I momentarily cannot find your email address, but send me an email at hankw@optonline.net and I’ll send back Mike’s email address so you can talk directly. You were right, Hank…I enjoyed the book. The last two chapters were especially well worth reading. Without givng anything away, I guess the best way to describe it is: a good explanation of the double Prince Tudor theory…and then some!! I sent in my money and got back a letter saying a second edition is due out August 15th. That is when I should send my check in for that improved edition. This is all fine. But people here should know. Again thanks, if the first one didn’t go through. Will update blog post. When would it be appropriate to “give something away”? It was a very good book, but I wonder what people think of A’Dair’s parentage theory concerning Oxford. That John de Vere was his father by Elizabeth is highly intriguing and would explain a lot, as A’Dair discusses. It would explain why Oxford glorifies both the de Veres and the Tudors in his plays, whereas if he were Elizabeth’s son only, he would expect to glorify the latter (and perhaps the Seymours), while he were descended by the the de Veres only, he could expect to praise only them. John de Vere also makes a much better father by Elizabeth than Thomas Seymour, who is something of a villain in all of this, and whose only claim to fatherhood is that he was in close proximity to Elizabeth. Futhermore, the autobiographical details of “Hamlet” make much more sense with John de Vere as the father, as he died shortly after he left his estates to Dudley, who had a history of poisoning people. This is the Dudley pilliored in Hamlet, who killed Oxford’s real father and is married to his mother (Elizabeth). In real life the two were lovers but not married of course. In other words, everything is Hamlet now makes sense. A’Dair says he has no proof for this theory, but it is a theory that fits very well with the facts. There has been little discussion about all of this on any blogs, but I would think there should be. I will not be offended if Hank delete this post because I give too much away–or for any other reason. I just want to know what people think. Very interesting analysis, John. I think it’s past time worrying about “giving something away” and time for getting into a discussion about it. I’m sure you know it, but just to say here that Mike A’Dair is not an author who writes something without giving it plenty of thought. And also that his book is worthwhile for many other reasons. Thanks for the comment.